My boys are OBSESSED with the Three Little Pigs. After reading it for the 1000th time, I thought we needed to mix it up and do something to bring the story to life. 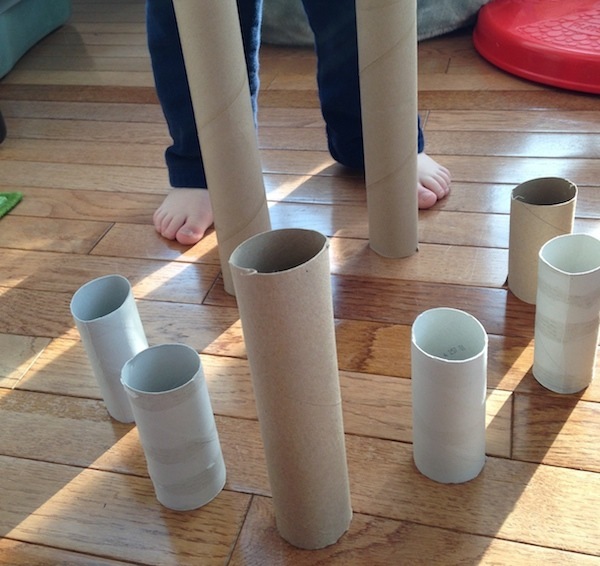 We came up with this fun activity and have played it pretty much every day since. 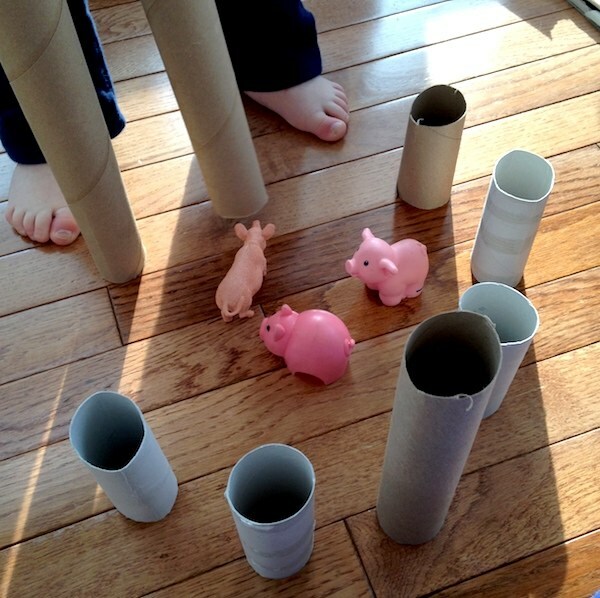 It's easy to play and keeps them entertained for hours! 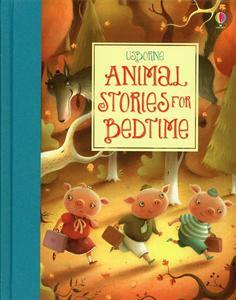 It started with this wonderful collection of Animal Stories for Bedtime. This is a great compilation of many classic tales like the Ugly Duckling, Country Mouse & City Mouse, and of course, the Three Little Pigs. Now it's time to play! 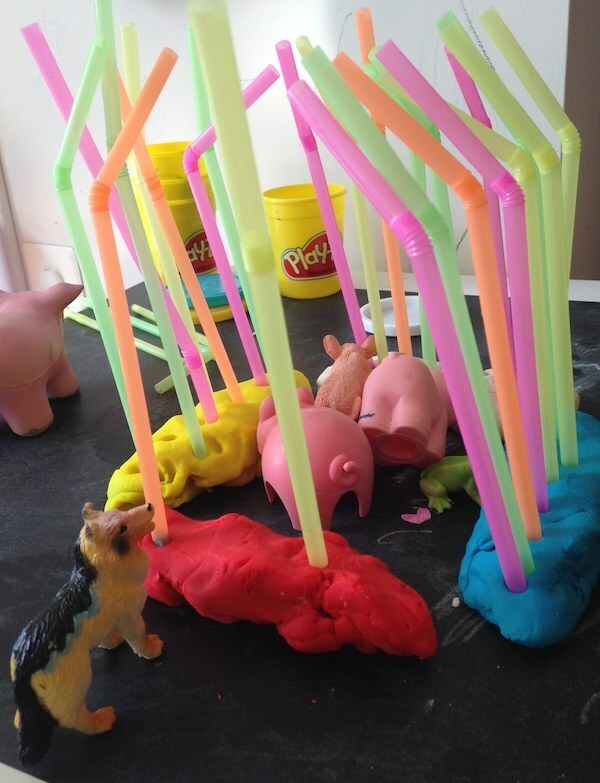 We started by building the first pig's house of straw. 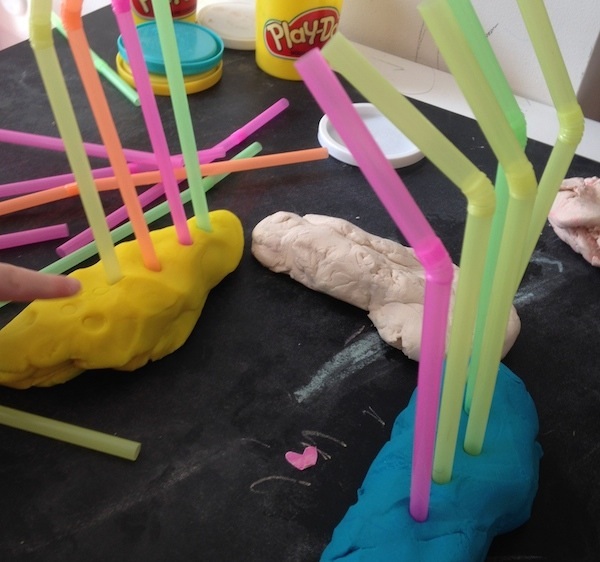 To build the house of "straw," flatten 4 pieces of play dough onto your surface. This will be the base of the house. Then press the drinking straws into the dough, bendable part up. Bend the tops to form the roof. 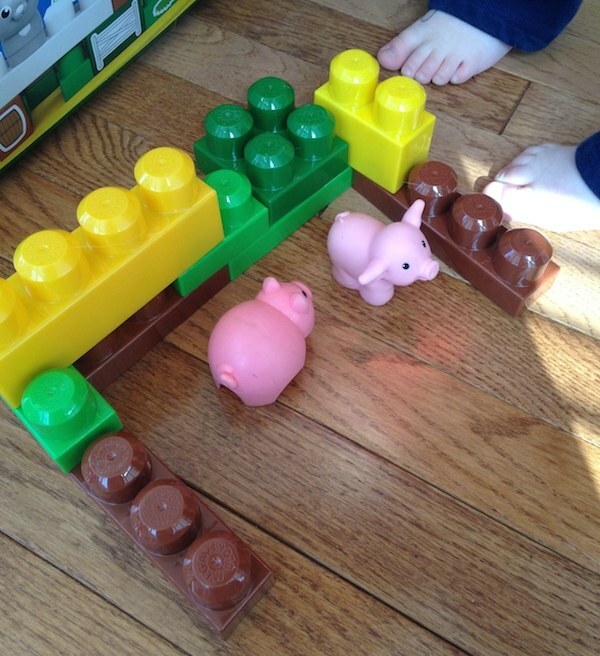 Now add your pigs and wolf as you tell the story! You may notice that there is also a frog in our house. He's not really part of the story but when you have toddlers, you go with the flow. Then see if you can blow the house down! Or knock it down, as the case may be. Now it's time to build a house of sticks. 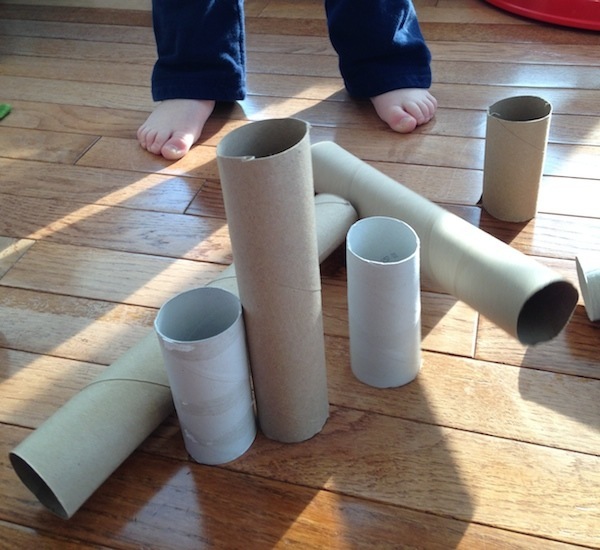 Our "sticks" were empty paper rolls, which my boys arranged on the floor into a house. 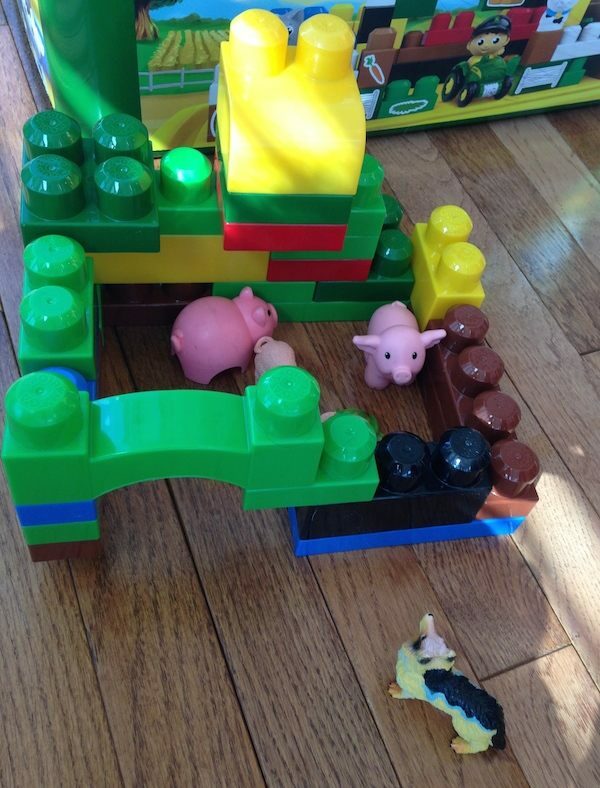 Again add your pigs and wolf to tell the story! Then blow the house down! This one was my boys' favorite things to do because they could actually BLOW the sticks over. Finally it's time to build your house of bricks. We used our building blocks to make a strong brick house. And of course, the wolf (or the boys!) couldn't blow this one down. We really love this activity. It's a wonderful way for us to have fun with one of our favorite stories, and it makes the story come alive for my boys. This activity also provides learning opportunities for us to talk about why the straw and the sticks are not so strong, but the bricks are. 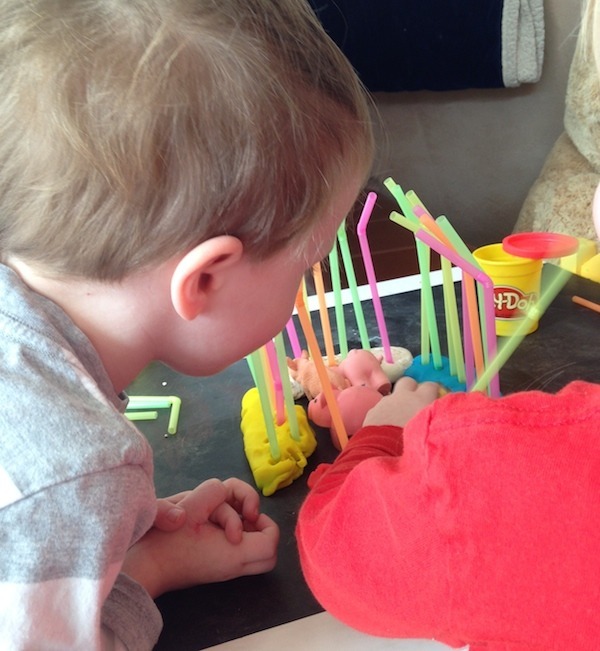 It also gives them lots of fine motor and building skills practice as they construct their houses. And, it uses simple materials that we already have at home. No wonder it has become a favorite! 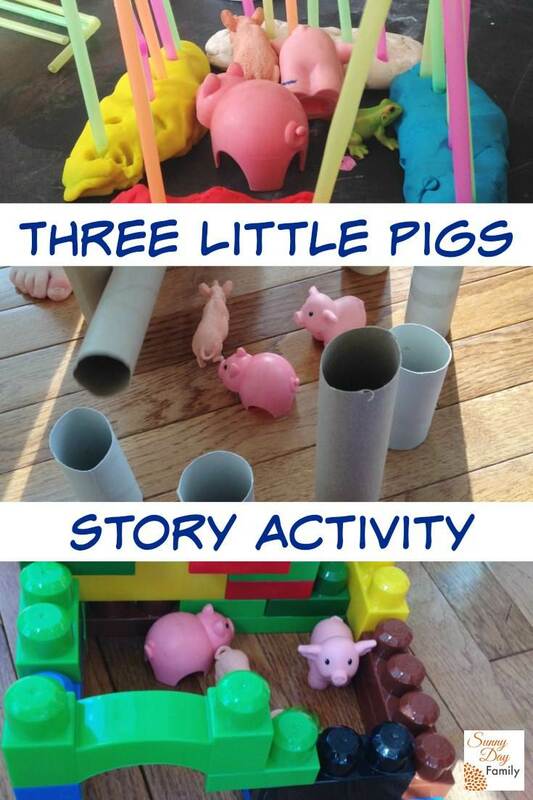 Love The Three Little Pigs? Find more activities, crafts, & printables here! I love your blog, Laura! So many fun ideas! Oh, this is so cool and looks like so much fun! Thanks for sharing the idea! I found you over on Saturday Evening Family Friendly Free For All linky party. So glad I did because I am going to pin this one!